Axel Witsel is back in European football as the Belgian midfielder has signed for Borussia Dortmund. All my Witsel memories are from Russia. As part of the Futbolgrad Network, I have covered football in the post-Soviet space since starting on my thesis Selling the People’s Game: Football’s transition from Communism to Capitalism in the Soviet Union and its Successor State at King’s College in London in 2011. I remember when Zenit signed the Belgian midfielder in September 2012. It was one of the most controversial transfers in Russian history. Zenit had not just signed Axel Witsel but also Brazilian winger Hulk from FC Porto. The two cost a staggering €80 million together. This was a time before €50 million+ transfers were commonplace and it was also a time in which Russia was deemed to be the next emerging football market. It was a fascinating time to start a project on Russian football and, of course, Witsel and Hulk going to Zenit were a major part of the research. The two instantly were singled out by Zenit fans, who felt that signing black foreign stars did not fit the club’s philosophy. Zenit’s fan group Landscrona wrote an open letter at the time protesting against Hulk and Witsel joining the club. Zenit fans were quickly the most racist fans in Europe – of course, the story was not that simple but ahead of Russia hosting the World Cup the story of black players being ostracised by Russian fan groups fit in well with the British media. The club’s fan letter was accompanied by player protests with the likes of Igor Denisov being eventually forced out of the club. Witsel and Hulk faced adversity to make a move not just in Russia but also abroad. Both players were deemed legionnaires more interested in money than in their careers. Who after all would go to Russia? This was a different time, after all. Zenit and many other Russian clubs were the equivalents of what the Chinese Super League is today – more on that later. Russian football fuelled by oil and gas was on the up, and the budgets seemed limitless, and it was only supposed to be a matter of time until one of the big clubs in Russia were supposed to win the Champions League – of course, that never worked out. 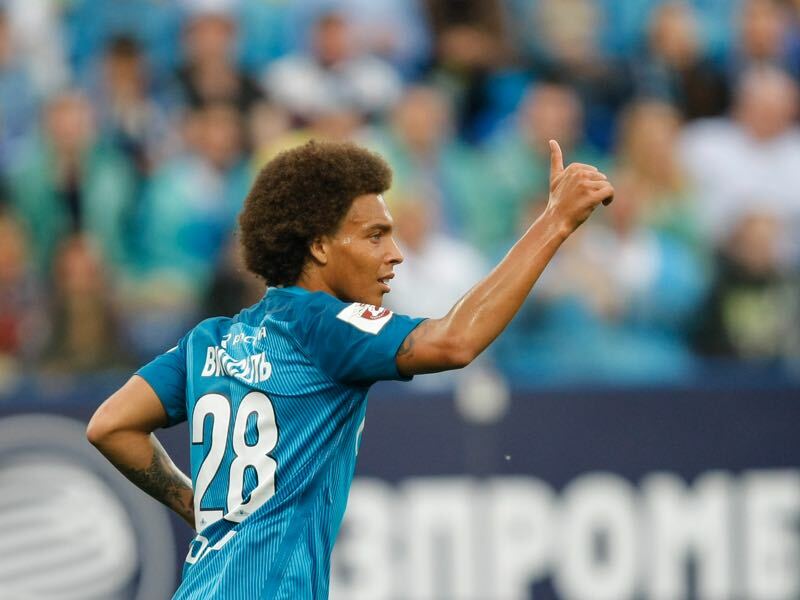 Witsel was on among the first to make the big money move to Zenit a club owned by Gazprom. The Belgian was one of the most interesting midfield enforcers in European football. Making a name for himself in Portugal Witsel had already faced adversity in Belgium after committing a horrible foul against Anderlecht’s Marcin Wasilewski while playing for Standard Liege in 2009. What followed was a witch hunt, but Witsel stuck through it and in 2011 he earned himself a €20 million move to Benfica. That transfer was supposed an in-between deal – a stepping stone to a big European club. Instead was followed was a transfer to Zenit in 2012. Money was the main reason. Back then players in Russia did not only earn a lot of money but, as it is still the case today, only had to pay 13% in taxes on their wages. At the same time, this was not an easy move. The racism was a real issue, and Witsel had to play twice as well as everyone else to gain the support of the Zenit supporters. Against the odds, he managed exactly that. While the club, and its fans, were often criticised for racism what is completely overlooked in the story is that both Witsel and Hulk would eventually become fan favourites. Axel Witsel, in fact, helped to bring a culture change to Russian football. All of a sudden foreign stars were no longer an exception – quite the opposite they were expected by the fans. The midfield enforcer would not just play 180 games, scoring 22 goals and 14 assists in the process, from September 2012 to January 2017. He would do it in style standing up to difficult fans, winning them over, and doing it in a climate, I am talking about the weather, that was not always easy to handle. I remember covering a Zenit Champions League match against Olympique Lyon in November 2015. Looking at the Petrovsky Stadium from across the street I knew what was awaiting me – cold, wet temperatures of about -5 degrees Celcius. You might say -5 degrees and snowfall is not that bad. But St. Petersburg is located right on the Neva, a giant river floating into the Baltic Sea, and the high humidity means that the temperatures feel much colder then what they are in reality. Axel Witsel played in this climate and excelled. In that particular game, Axel Witsel assisted a goal in Zenit’s 3-1 victory over Olympique Lyon. What impressed me the most, however, was Witsel’s leadership and command over the midfield area. While I was freezing on the stands of the Petrovsky the Belgian midfielder was easily the best player on the pitch doing the simple things that made the difference between the two clubs on that evening. 13 months later Witsel was sold to China. Joining Tianjin Quanjian for €20 million it was another move that raised eyebrows abroad. The Belgian midfielder was once again described as a legionnaire preferring money over advancing his career. Offered €18 million a season it is easy to understand, however, why Witsel went for the paycheck. Completing one season in China would be the equivalent of three full seasons at a top European club. With Witsel moving to China Witsel somewhat dropped off the radar of major clubs. That was until the World Cup. Once again this correspondent tracked Axel Witsel down in Russia. This time at the 2018 FIFA World Cup that took place in Russia this summer. Witsel was the unsung hero of Belgium side that ended up finishing in third place. Axel Witsel completed an unbelievable 94.2% of his passes throughout the tournament – the third highest among all Belgium players. While acting as a midfield metronome for Belgian Witsel, however, also patrolled the midfield aggressively averaging the most tackles among the Red Devils players that have played more than one game with 1.8 tackles per game. 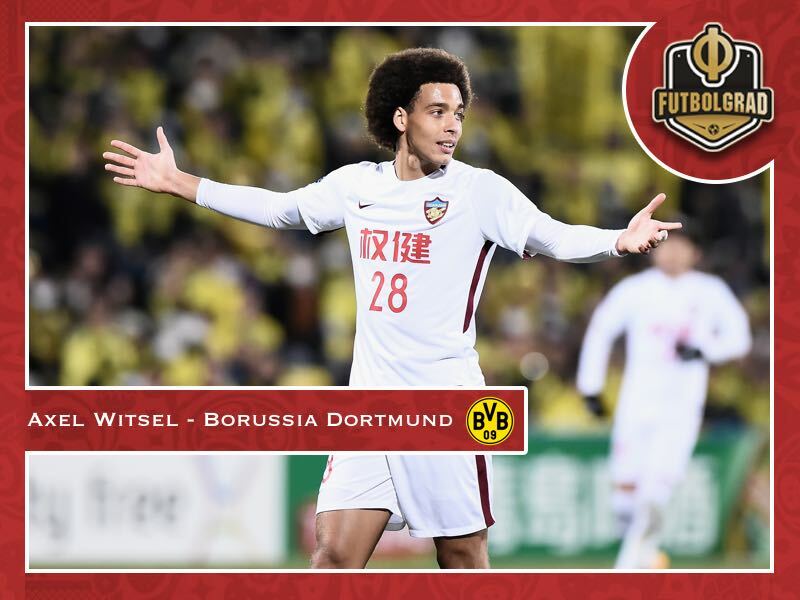 Going by his World Cup performance, it is, therefore, no surprise that Borussia Dortmund targeted Axel Witsel, despite already signing Thomas Delaney, earlier this summer as a midfield re-enforcement. Hence, when it became known that Witsel was willing to take a significant cut in his €18 million salary and come back to Europe Dortmund were right away interested. 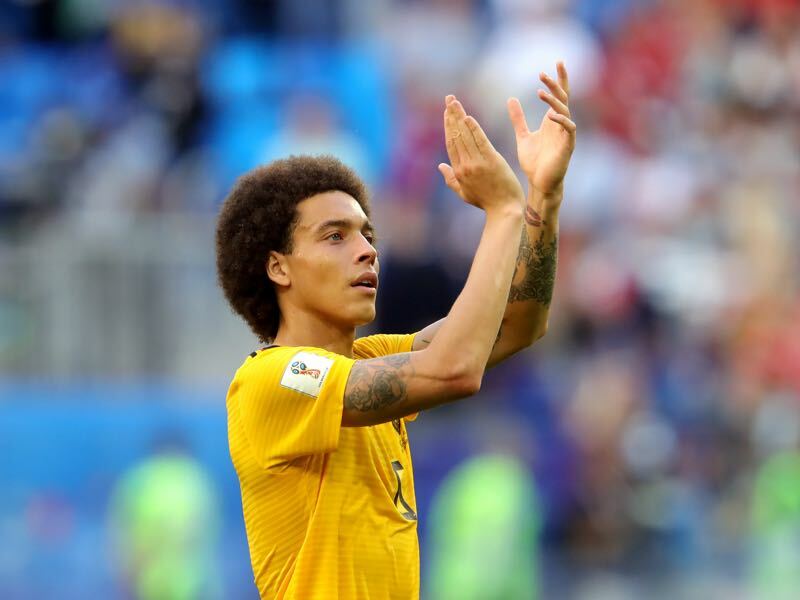 The World Cup, in particular, has put Witsel back on the radar. Now with Axel Witsel signing for Dortmund, the midfielder is not only back on the radar in Europe but also ready to make an impact in one of Europe’s strongest leagues. Great article. Love your work, keep it up. Axel Witsel, was one of the best midfielders that had dressed SL Benfica’ kit. He’s not that simpl box-to-box that depends on physical strenght and endurance to take a part on his game. Witsel is class, great vision, tactical awareness and endurance, as well. To sum up, He could be an asset on BVB’s squad.